Mouthy UFC star stayed mute Friday after his night inside a Brooklyn jail cell, charged with instigating a Barclays Center brawl with his fellow fighters. The brash, bearded mixed martial arts champion, described by his lawyer as “the most visible face on the planet,” slipped away in silence after posting $50,000 bail. McGregor cut a cocky figure as he exited the Brooklyn Criminal Courthouse — chest and chin up, with hundreds of fans snapping pictures after waiting in the cold for hours to see their hero. “Yes, your honor,” were the defendant’s only words in court, when asked if he understood a court order to stay away from five of the victims. McGregor ignored questions as he and co-defendant Cian Cowley were escorted by the fighter’s entourage into a waiting white SUV. The vehicle drove off, with both defendants due in court again on June 14. Hours earlier, McGregor was led from the 78th Precinct in handcuffs, wearing the same blue-collared shirt and jeans as when he surrendered to police Thursday night. He was still in cuffs when bought to the courtroom. The controversial Irishman faces felony criminal mischief and other charges for the retaliatory attack — captured on videotape — against a bus carrying other UFC fighters to a media day event. A criminal complaint charged McGregor, 29, with flinging a metal hand cart into a bus window, shattering glass on UFC fighters Ray Borg and Michael Chiesa. He was also charged with punching a security guard in the head with a closed fist. “He is captured on video surveillance picking up a chair and throwing it to a passenger window of that bus causing injuries to several individuals inside the bus,” said prosecutor Wilfredo Cotto. Another scene in the video showed an enraged McGregor grabbing a metal barricade before several of his cohorts stopped him. UFC head Dana White, speaking on Fox Sports 1, said McGregor imported a group of hooligans to Brooklyn for the purpose of attacking the bus carrying UFC fighter Khabib Nurmagomedov. The festering ill will stemmed from bad blood between McGregor’s pal Artem Labov and Nurmagomedov, as well as the former champion’s rage over losing his title belt due to inactivity. McGregor’s last UFC bout was back in November 2016. The crazed attack caused major problems for the scheduled Saturday card in Brooklyn, with Labov booted for joining McGregor in the attack while Borg and Chiesa were sidelined with injuries caused by the shattered glass. Borg suffered a corneal abrasion, swelling and bruising, while Chiesa received cuts to his nose, ear, forehead and hand. The card will go ahead with just nine of the 13 scheduled fights. 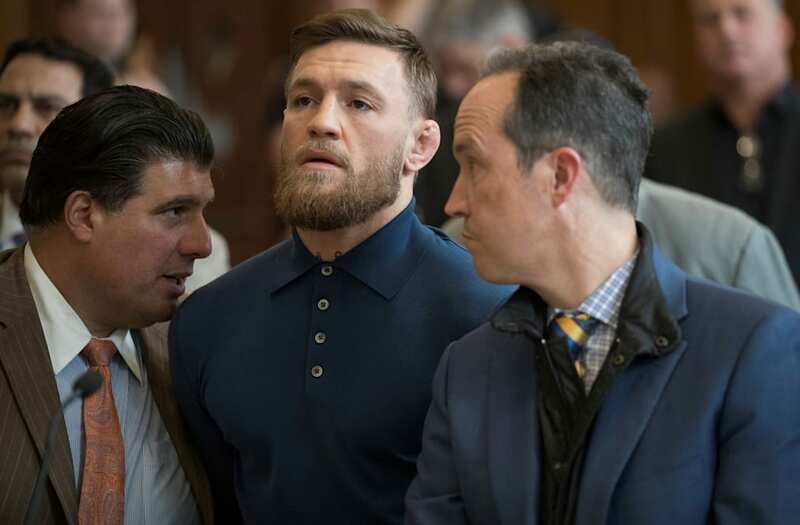 Cowley, a member of McGregor’s posse and a fellow Irishman, was released on a $25,000 bail package on charges of criminal mischief, reckless endangerment and assault. Both were permitted to keep their passports and travel between New York and Ireland pending trial.